Thaddeus is a man most try to ignore, despite his tall and imposing stature. In truth he prefers it that way, always on the lookout for who knows what. Firstborn of the Crowe clan, Thaddeus’s birth turned a quick-fast night of passion, into a family rife with conflict. Pop was a Gambler -never was the best- and took to drinkin whenever he broke even, but on his good ‘n sober days, he’d teach his boy all the ins and outs of just about any card game there was. Believin his boy to have “The Sight,” he even showed him a Hoyle’s Book of Games, to see if Thaddeus could help him find a better way to win. One night when Pop came home, white as a sheet, and reekin of sauce, Maw had had enough of his squanderin, disappearing with Pop and comin home alone the next mornin. From then on, not a soul for miles would pay any mind, when he spoke of strange critters, and ghosts he’d see, or the feelin of a distant evil lurkin beyond the horizon. Following a terrible accident with Abel, Thaddeus ran away from home in his teens, and it's been nigh-on 20 years, since he's seen home. Abel Crowe is a big man, and not one most forget. At nearly six and a half feet, with hands like bear paws, he moves with a casual calm. Second-born of the flock, he grew up in the shadow of an older brother who took after Pa and always seemed to have a little somethin' extra. Abel was a quiet young'un, but the anger starting flowin' after an awful accident with Thaddeus left him on death's door. He flew the nest when he was nearly full grown to make his mark in the chaos of the civil war. More at home in the saddle than on his feet, he's a man who speaks with lead. Familiar with violence, those who ride with him give him a name to match the rattler tattooed on his right arm: Ti'ish. He returns now to the nest, an appointed circuit judge, with a hard view of justice from his years in the rough riders to seek vengeance for his ma. Elijah Lee Crowe was the third brother born, and with the adoption of Lucky, he became the middle child of the Crowe brood. As such, Ellis formed strong friendships with all four of his brothers, and from a young age, acted as a mediator whenever conflict arose between the boys. 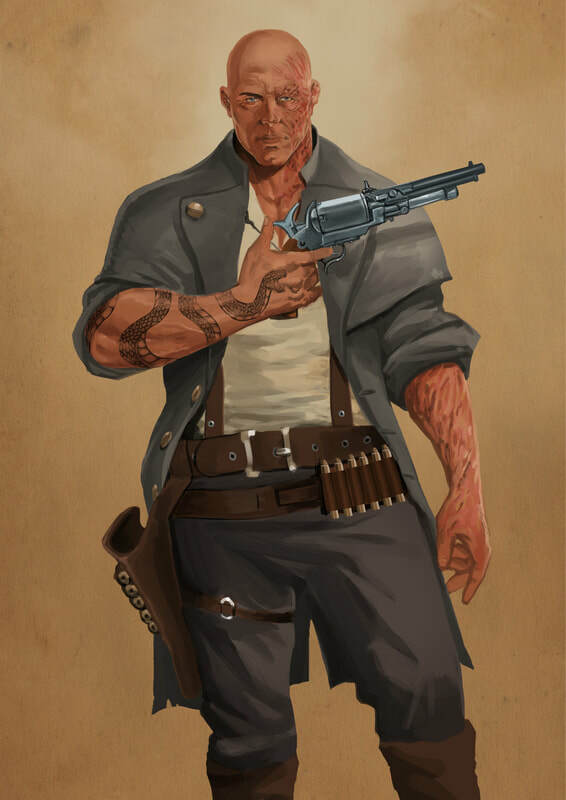 He quickly gained a reputation among the citizens of Silvertree for being reckless, some might have even claimed he had a death wish, but that was far from the truth. Ellis simply had a taste for adrenaline, and was willing to do just about anything to get more of it. It was this hunger for adventure that eventually led to Ellis leaving home at the age of 14, traveling across the nation as a railroad worker for the better part of 10 years. 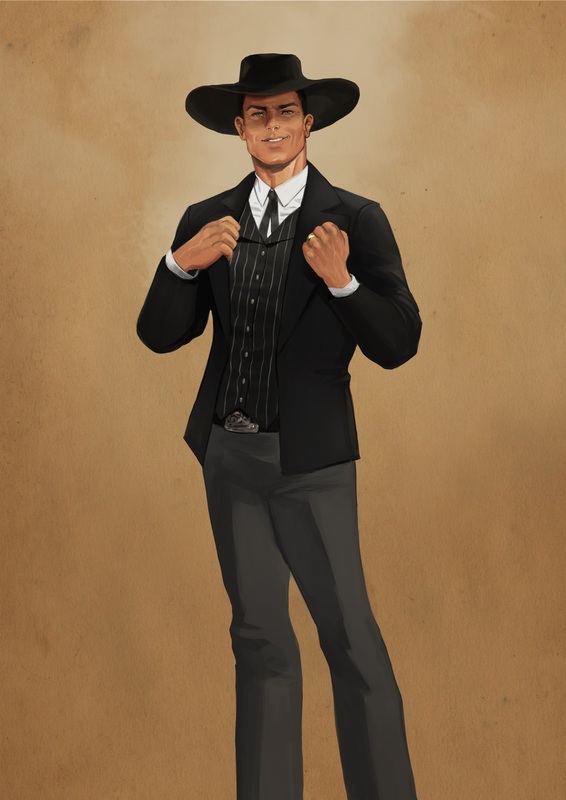 In his mid-20s he decided it was time for a change of pace, so he found work in Dodge City, Kansas as hired muscle at The Bullseye Casino. It didn’t take long for Ellis to fall for the Casino’s owner, Eliza, and they soon became husband and wife. Ellis has been living out a happy life ever since as the co-owner of The Bullseye, but even then, he’s tried his best to maintain his friendships with his brothers. For Ellis Crowe, there’s nothing in this world more important. Introducing "Lucky" Luciano Crowe! 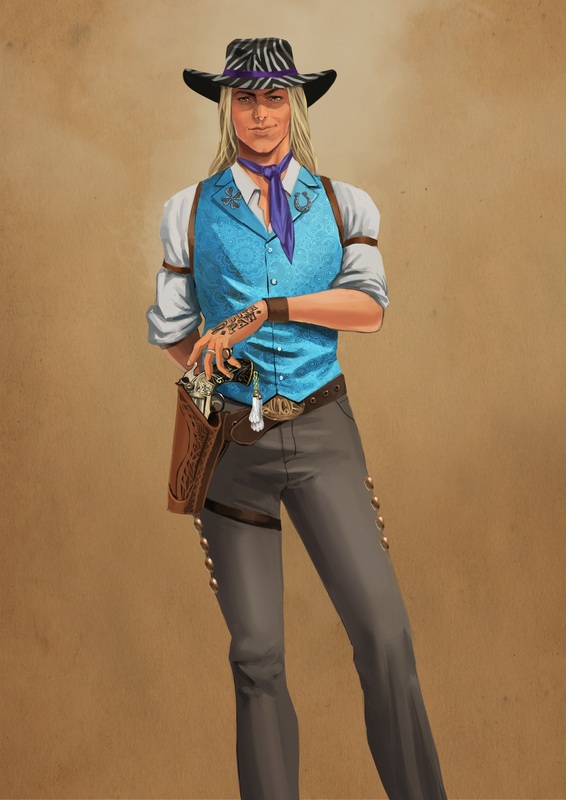 A tall, lanky, eccentric, long blonde haired Italian cowboy. A man that believes luck is incorporated in all parts of life, good for him he got most of his bad luck outta the early on in his life (or so he thinks!) He's a whizz with his 6-shooter "Lady", known far and wide as "the man with luck on his side", a duel against him spells certain death for any unfortunate soul to be opposite of this man at high noon. His light heart nature only serves to boon his absolutely piercing snake tongue, goading even the most cool headed of cowpokes into swapping lead. When Luciano come into town upon his beautiful spotted horse "Fortune" you're either in for the time of your life or a bullet in your heart, only Lady Luck knows! Harper is The youngest of the Crowe flock. He left home a few years back, and has started to make a name for himself as a bounty hunter. 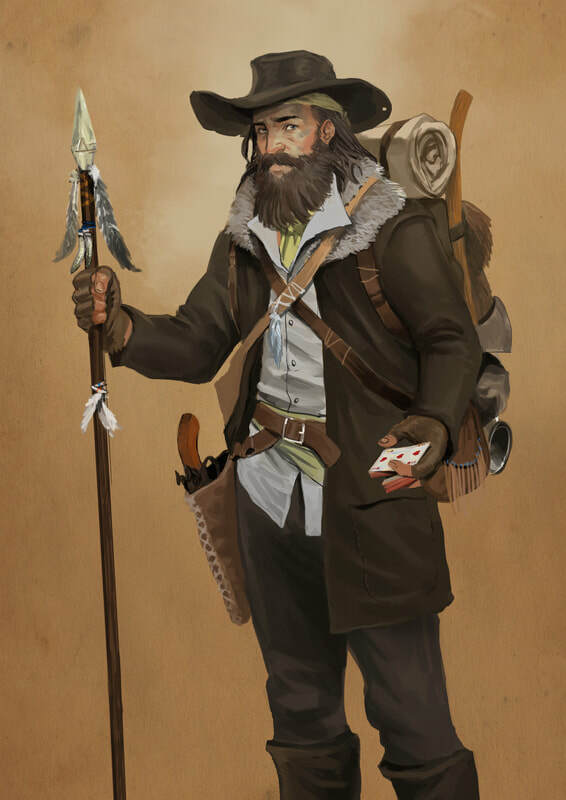 He’s known across the Midwest for bringing in his bounties alive. His friendly demeanor has made him plenty of friends throughout Colorado and the nearby territories. It’s not uncommon for people to know his reputation in towns he’s never visited. 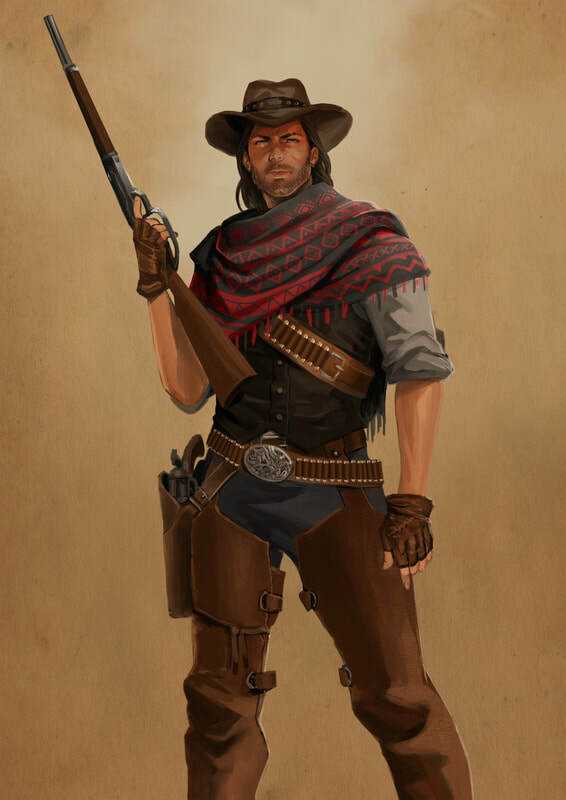 He’s a crack shot with his colt peacemaker and even deadlier with his Winchester. He can be seen wearing his trademark poncho, marked with grey and red details, thrown over his left shoulder. Harper bares the burden of his family's expectations: for him to be a man better than they could be. His whole life he's been cleaning up after his brothers, they were always starting fights, and he was always finishing 'em.